Someone asked me how fast I run a 5km, to be honest I don’t clearly remember. I am very sure faster than 30 minutes. and I seem to remember 25 minutes in one of my runs. Our human memory is often feeble, especially when I don’t really care much about the time for 5km. I have been looking into my 10km time. which is still about 1 hour. Fortunately I have been running using endomondo, and using the PRO version, I can look into my personal bests. 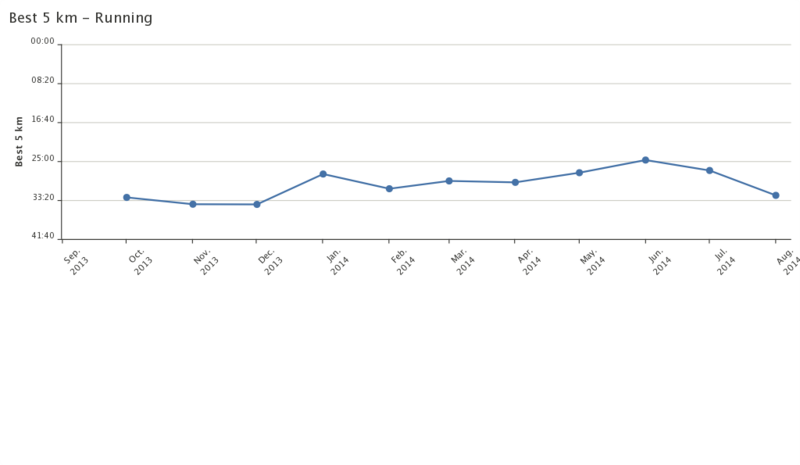 the following is a chart of my 5km personal bests in the last 12 months. apparently my best 5km was just under 25minutes! granted this is not the speed of elite runners, but hey, it’s my personal best. It was great to see how much I have improved over the month. although it seems I have been taking it relax in the last two months. I was curious so I checked by 10km times. My 10km times actually improved during the month of July, that was during the fasting month and I was doing night runs. I was doing several 10kms, and at least once was under 6min/km resulting in sub 1 hour 10km run. 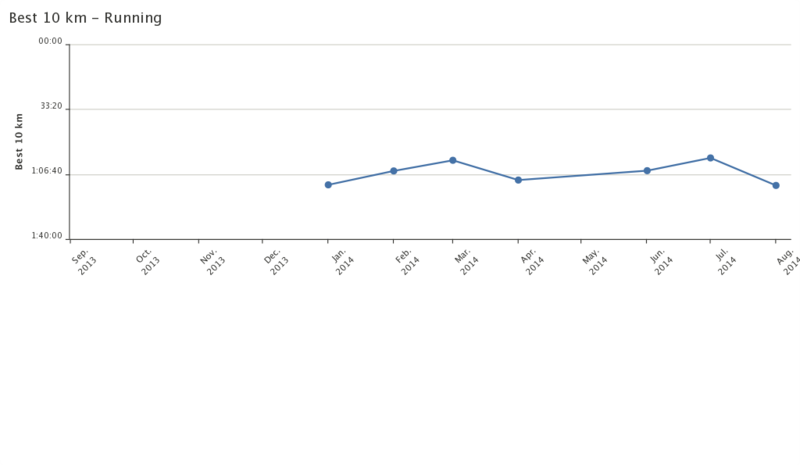 It so sad though to see the drop in performance as well as activity in the last 2 months. There are several upcoming events that will help keep me busy and reach that level again. Specifically I’ll need to improve on my cycling to improve my Triathlon times. Abundance, Health, and World Peace. I’ve been trying Waze for a year now. I love it. just be careful using it on the road. the interface allows people to update easily while driving, by just clicking about 3 or 4 buttons. But typing in descriptions is recommended for passengers. I love the part where you can pave/record your own map. there wasn’t a trail to my home, so i traced it by driving thru. I also like how users can report anything on the road and you can see them. Cars parked on the side, road under construction, and my most favourite… Police and Traffic reports. This would be perfect if a lot of people use this app and update traffic reports. So here i am asking anyone to try this out. Check it out at www.waze.com. its available for android, iphone, and some nokia phones. Just a warning.. obviously this app uses your data bandwidth and GPS. so it’ll use your battery life and credit. Recommended if you have a car charger and a post paid plan. Thanks to Tim for creating this! You should like get BT to hire you to make this stuff… or at least get income from admob man. The Brunei Times Unofficial Android App beta. I’ve been trying Waze for a few days now. I love it. just be careful using it on the road. the interface allows people to update easily while driving, by just clicking about 3 or 4 buttons. But typing in descriptions is recommended for passengers. I love the part where you can record your own map. there wasn’t a trail to my home, so i traced it by driving thru. I also like how users can report anything on the road and you can see them. Cars parked on the side, road under construction, and my most favourite… Traffic reports. This would be perfect if a lot of people use this app and update traffic reports. So here i am asking anyone to try this out. Check it out at www.waze.com. its available for android, iphone, and some nokia phones. Just a warning.. obviously this app uses your data bandwidth and GPS. so it’ll use your battery life and credit. Only recommended if you have a car charger and a post paid plan. I’ve used the Athan Prayer Time from http://www.islamicfinder.org previously to keep track of prayer time, But i’ve recently compared it with the schedule from http://www.information.gov.bn/VER2/content/view/611/197/ and found it a significantly off, so I’ve tweaked at the settings to find the same results. Alas, I could not.. entirely.. 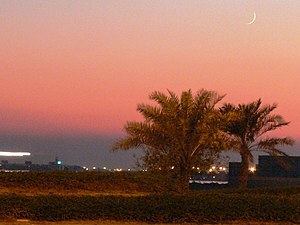 The time of suboh, sunrise, maghrib and isyak is now the same, but the zuhor and asar prayers are off plus/minus 1 minute. well at least the maghrib one is on the dot. Break fast time is important in this month of ramadhan. 🙂 the settings i change was to set it to twilight degrees for fajr at 20 degrees and isyak at 18 degrees. if anyone can make it the same as the Brunei schedule please tell me. Also I also managed to embed a small daily schedule on http://www.livewire-brunei.com, I have yet to manage to put it on this blog. something to do with incompatibility of iframe and wordpress.com. Additionally, there is a mobile phone software version. if anyone wants to try.